Born in Maputo, Mozambique, and dividing her time between Portugal and South Africa, Ângela Ferreira is an important figure in Portuguese contemporary art. In this interview, she talks about her work and its trajectory. 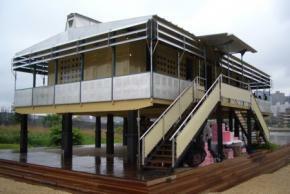 Casa Maputo (Maputo House) embodies your process of production and exhibition very well. The installation has two screens, on which images are projected from your childhood home in Mozambique. One of these screens is concave and the other is at a right angle. A formal curiosity: how were they made? This question is crucial in the thought of Casa Maputo. 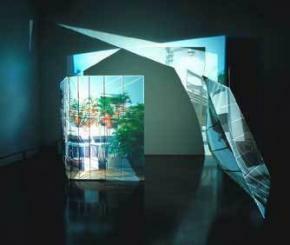 As you may or may not know, these projection screens are based on projections that are made by cartographers. Cartographers, when they draw maps, have a terrible problem to solve, which is the fact that the earth is round and the map is not. They have to represent something three-dimensional on a flat plane. That is, they are always lying in some way because it is very difficult to represent the three-dimensional on a flat plane. And as is quite important to try not to lie about the shape of the continents, they invented a series of projections to try to correct the defects in the interpretation going from three dimensions to two dimensions. There are seven or eight well-known projections, and they are geometric techniques of representation. They’re like graphs, so you see the horizontal and vertical lines. Some are scaled to better correct defects in the corners of images, while others deal more with correcting the defects in the center of the image. Actually, none of them are perfect, but obviously some are closer to reality than others. What comes of all this is a bit of the idea that there is no map which gives us the true shape of the continents. Because those are only represented on a globe like the ones that children have on desks and in schools for learning. So much of the work on Casa Maputo was about how it is that this house is here, located on this site that is so remote, so strange on the planet, and so little modernist, in a sense. Originally I worked with four projections, I chose four ways to represent mappings. But ultimately the project was completed with only those for formal and aesthetic reasons. So one is the Robinson, Robinson projection, and the other is the Gnomonic, which is the name they have, given by cartographers, it was not me who invented these names. I choose the two projections that are considered the forms of representing the world most closely to reality, none of which is the reality. That is why it is literally as the cartographers work, they try to flatten the three dimensions because they depart from projections of graphs that have that format. What happens is that when you project a video on a surface that isn’t flat, you end up having a distortion of the video, so what happens is the opposite. The cartographers are working to correct the flattening of the land that is three dimensional, and when we project an image that is made to be projected on a flat surface on a surface which is not flat, we distort the shape. The video we’re seeing is always a distortion of the house, isn’t it? It looks pregnant. More elongated, right? Casa MaputoIn Casa Maputo, two distant historical moments are placed side by side, as if the work seeks to establish a bridge between them. I had two records of the house which were very significant for me; one was of the house when the house was brand new, taken from a black and white photograph which my father took, which was a photograph very, very sui generis, in the sense that it was difficult to see the geographic details, I looked at the picture of the house without being able to recognize where it was located.The last picture I took of the house before finishing the work is in color, and it’s very interesting because African vegetation already dominated the house, there are many marks of contemporaneity, with satellite dishes, grills on the windows to protect it from thieves… The two photos were very symbolic for me of the nearly fifty years that had passed between the construction of the house and the utopian dream of a neutral modernist house. Your work often makes reference to the Russian avant-garde and modernism. Perhaps there is some ambiguity: both a position of admiration/affiliation, and a critical reading, pointing out failures. That’s it, my work plays a lot with these dualities. On the one hand, there is a kind of willingness, a curiosity to understand the project of utopia, where people believed it was possible to build a new and better society. Because utopia is not only building the new, utopia was to build something much better. It exists as much in the modernism of Prouvé as in Russian constructivism. On the one hand, there is a willingness to reexamine this, but there is a willingness to examine it because there is a kind of disillusion with the current proposal. The current proposal is not very strong… The world we live in now is a world in which we accept the failure of utopia. My project says a little, ‘Well, here we go again looking for this moment in which we believed,’ let’s see why it was believed, in order to better understand why it failed because how are we able to invent, how are we able to build a new utopia without understanding what it was that failed and why it failed? Of course, in a way my project is very critical, but it is also a project full of hope. Almost like finding a new enthusiasm for something new, something, future, which can be built. Yes, absolutely. Because today there is something of an almost nihilistic point of view, that it’s not worth it, it is only worth it if we solve our problems for ourselves, to continue on. I don’t believe this, and in that sense I am very old-fashioned. I still believe in a world where it is worth it to fight, together, for a better world, but I also know it’s not worth it to fight as Bob Dylan fought, nor as Samora Machel fought. There’s a world to build that is different than the earlier utopia. On the other hand, there is no point in saying that those people who believed in utopias were stupid, were lunatics, that it was an impossible utopia. It’s true that it was an impossible utopia, but it interests me to reexamine it in order to understand from it, to build a future because I still believe in building. It is in this sense that modernism and Russian constructivism are crucial moments for me because people believed in them. When Prouvé made a project to build 10,000 houses (laughs) in Africa, he was crazy, from our point of view that was an absolutely insane and obscene project. But I believe what he believed. And one of the aspects of Maison Tropicale was to try to understand how it was possible to believe in that and where they wanted to go with it, when it was obviously offensive to us, and silly, and expensive, and it wasn’t practical, but they believed, they believed that modernism was a better way to live, that people would live in houses that were more democratic, it’d be easier to live, they would save more money, they would have healthier, cleaner lives, but this is not necessarily true. What people gained with modernism was something a little different. What do you think of the term postcolonialism? To me the term is very complex because I’m not a theorist. I do not write about art. However, it’s obvious that the issue of postcolonialism is relevant to all of us working in these areas and especially those who travel from one continent to another. The idea of postcolonialism on one hand is a fact. If we think politically speaking, colonialism ended, that is, the countries are independent. This is, on the one hand, the expression, and in Portuguese it is sometimes used this way. On the other hand, theoretically speaking, the term postcolonialism is not referring precisely to this, in my opinion. It is one more approach to the representation of Africa and the African and the role he has precisely in relation to the center, to Europe and the United States, mainly. When the term began to be circulated, when I noticed that the term existed, that it was in the air, in the 70s, 80s, I was living in South Africa. It is actually a terminology that refers to a new integrationist way of trying to include other discourses than the mainstream modernist discourse, it is a term that comes hand in hand with the idea of postmodernism, which diversifies the ways of seeing, looking at the other in a different way, noticing ways of looking as part of an important discourse. But this terminology is actually invented in Europe, and perhaps with some participation from Australia, America, the United States. It is not a terminology that made sense for an artist who was there in Cape Town working and finishing school. It was not our terminology, so to speak. Of course, in some ways my work is more or less integrated into the wave of new acknowledgment of other artistic registers that came with the idea of postcolonial discourse, isn’t it, of how to break this idea of the supremacy of Europe and the United States in relation to Africa and other non-European countries, including Latin America and probably others, isn’t it? In a way, in relation to this, in relation to this fight to try and make the art world more inclusive, more tolerant, more democratic, much ground has been gained. And in that sense I think the idea of postcolonialism is a project that was valid, and from my point of view is still valid, since I also don’t feel like this fight is over, that this discourse, this energy that is needed to equalize things… The biennial in Dakar still doesn’t have the same value as the Venice Biennale… And so I also think that it is premature and strange to think of the end of postcolonialism, because it still seems like nothing has been resolved. Exactly. Yes, that everything is resolved, and that is not true. The very colonial attitude exists in abundance, I mean, I did a project about Maison Tropicale, where in 2002, Europeans go to Africa and blatantly steal two houses to sell in Europe, I mean, if this isn’t neocolonialism, then what is neocolonialism? I couldn’t define it any other way. Indeed, for a long time, during my project, when I was making Maison Tropicale, there was a lot of press before the Venice Biennale, and people often say, “Oh, because your project is part of a postcolonial discourse.”And I always said, “Ok, calm down. I don’t know if it’s part of a postcolonial discourse. My reason for making it could be inserted into a postcolonial discourse. The act of stealing the homes is neocolonial. It’s theft.” If the houses were found in France, they would never have been taken from the site where they were, never! It was unthinkable, they would then make a little museum in I-don’t-know-where, the same thing applies to Portugal. What is your relationship with cinema? It occasionally appears, in a quote from Wim Wenders, Jean Rouch… Is it an art that interests you? My relationship with cinema is very sui generis, because it is a bit of the role that cinema has as a cultural agent. The first work I made about cinema (or at least the first that I remember), is a work called Cape Town Film Festival. In 2003, I was looking at the newspaper, and saw that James Polley, who was an organizer of the festival at the time I was young and going to school, had died. I began to research his life and think a little about the festival, and came to some conclusions. The first is the issue of Apartheid. I studied in South Africa during Apartheid, and there was a cultural boycott, the rest of the world would not let their culture in, nor let South African culture leave. But of course the world is not completely impervious, is it? There were movies, there was television, there were magazines, there were newspapers that people could receive. The contact with cinema was made through year after year of film festivals organized by this gentleman called James Polley, who was a political person, so it was listed in the ANC, which was still illegal, and organized a film festival every year that was an underground festival, running slightly on the margins of the country. And in this incredible way, this man who came here to Europe and Brazil and the United States every year and literally brought films illegally in his luggage back to South Africa and showed the movies that were on. Fassbinder, Herzog, all the Germans, some Brazilian movies… The first film from Manoel de Oliveira I saw was in Cape Town, at one of these film festivals: Amor de Perdição, four hours and 30 minutes of film! When James Polley died, I realized that much of my visual culture was gained through this incredible experience that he had offered for seven or eight years, making a huge effort, with a huge risk, because he could have been arrested, could have been tortured, possibly even killed, to show us, every year he showed us 40 or 50 films. So my relationship with cinema appears as visual and political education. When I was in Niamey with Manthia Diawara to shoot Maison Tropicale, he told me about his film Jean Rouch in Reverse(1995) and Jean Rouch. He told me that Rouch had a very special passion for Niamey, for Niger, where he died. Everywhere where you are going in Niger, in Niamey, you find people who were actors in Rouch’s films. Diawara also told me about the fantastic project Jean Rouch did in Mozambique. I couldn’t resist. When I understood the historic moment that Jean Rouch was there - the post-independence, hope, utopia - and the film he made [Makwayela, 1977], I thought it was absolutely amazing. It’s a film made with guys who had been employed in South African mines, which is a condition that I know very well, as a half South African. When I was began to ask questions, interviewing people about Rouch, people told me, “But Godard was there too,” one thing came after another, in a way. But I think it’s because cinema has a very important role in the visual culture and politics of our time, doesn’t it, and so it is natural that these images, this form of expression, these records intersect with my interests. The presence of Modernist architecture in Africa is ever-present in your work, especially in the paradox that joins futuristic utopia and ruin. Was this architecture born as aruin? Is it like a perversion of artistic goals? I always wonder: were these artists also colonialists? Were they also fascists? What was in the heads of these people? You have a very strange situation there: Le Corbusier, who is considered a great master, was supposed to build for the colonial government, and not only them because he was supposed to build for independence afterwards. Working towards her doctorate in Cinema and Audiovisual Studies at the University of Paris 3, in cooperation with the Universidade de São Paulo, under the guidance of Philippe Dubois and Ismail Xavier. She received her Bachelor's degree in Social Communication from the Universidade de São Paulo, and worked as a journalist in the Brazilian press between 1998 and 2005. In paris, where she has lived for five years, she received a Master's degree in Cinema Studies, co-directed the documentary Fragmentos de um Bairro (2008), with funding from the Préfecture de Paris, and worked as an editor. She is one of the organizers of the book Oui, c'est du cinema (Udone, Campanotto Editore, 2009), which detals with the relationshop between cinema and contemporary art. Working towards her doctorate in Cinema and Audiovisual Studies at the University of Paris 3, in cooperation with the Universidade de São Paulo, under the guidance of Philippe Dubois and Ismail Xavier. She received her Bachelor's degree in Social Communication from the Universidade de São Paulo, and worked as a journalist in the Brazilian press between 1998 and 2005. In paris, where she has lived for five years, she received a Master's degree in Cinema Studies, co-directed the documentary Fragmentos de um Bairro (2008), with funding from the Préfecture de Paris, and worked as an editor. She is one of the organizers of the book Oui, c'est du cinema (Udone, Campanotto Editore, 2009), which detals with the relationshop between cinema and contemporary art.